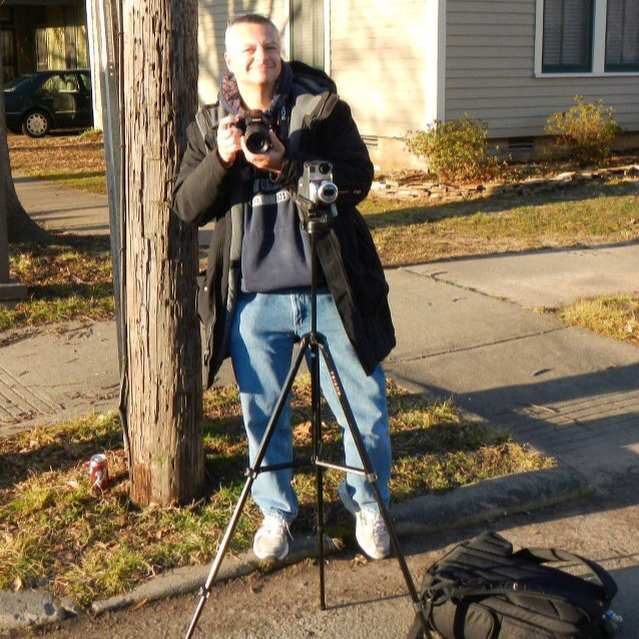 In prior posts you've read how Dave has raved about his GoPro Hero 3 Black. Great camera. One of the negatives with the camera is the sound quality while in the waterproof protective case. It's horrid. So Dave checked out some youtube videos and found a way to add an external mic to the GoPro. Here's what was required. - Drilling into the waterproof case (alternatively Dave could have bought the frame case but he wanted the added protection of the waterproof case). - Buying a second waterproof case for those times we want the camera to actually remain waterproof. So now we have a capital investment. One problem we tried to prevent while drilling into the case was keeping the drill plastic dust out of the lens area of the case. Still some bits in there. So we bought the lens replacement kit. 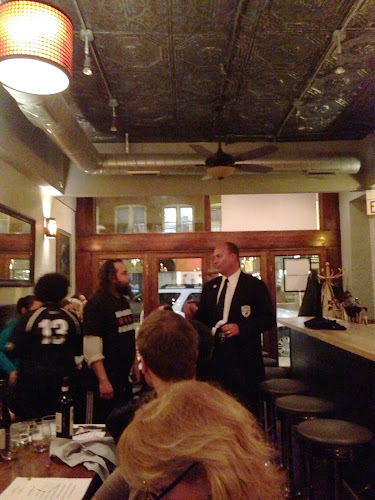 A couple weeks ago our friends got wind of an event down in Chicago at a restaurant where their son used to work. They have become good friends with chef/owner. It was a cook-off between Ripasso's chef Theo Gabriel and Schwa's chef/owner Michael Carlton. The event was limited to 30 people and the proceeds were to benefit the Chicago Wapiti RFC Youth Rugby Program. Quick background. 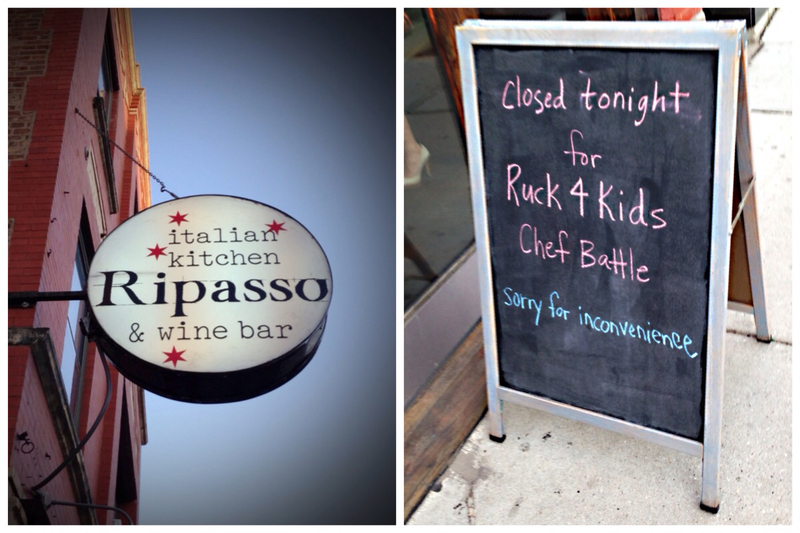 Ripasso is a great Italian restaurant in Chicago's Wicker Park neighborhood. 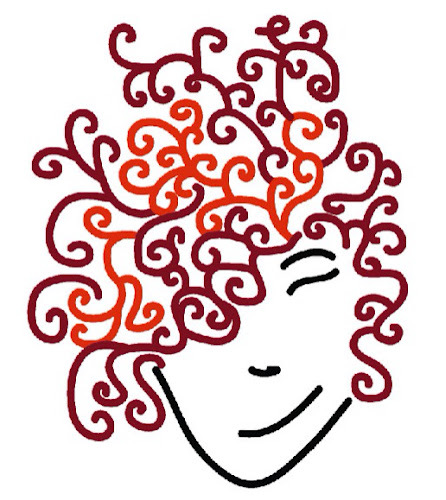 For a short time they have created an alter-ego for the restaurant called Red Headed Stepchild. 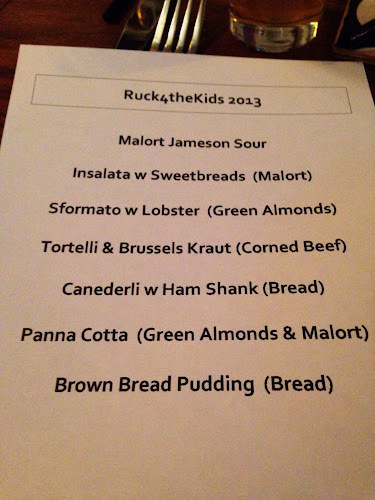 For a few weeks they featured some Irish fare in addition to their Italian food. Schwa is a well-known restaurant in Chicago with an outstanding reputation. 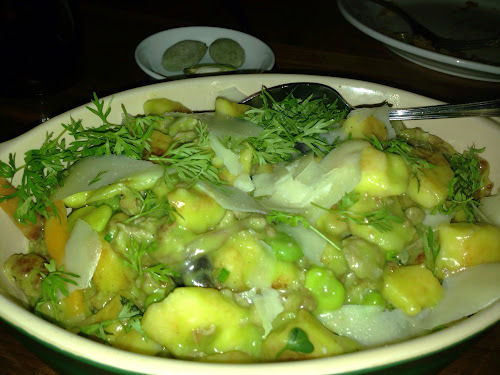 We've not eaten at Schwa and have heard from many that reservations are extremely difficult to come by. This should make for a fun evening. The four of us arrived right on time and were seated at a 6 top with another couple. The staff was all decked out in rugby gear. It was explained to us that both chefs would make a course within the same theme. At the end of the night we'd vote for best execution and the losing chef would get a tattoo picked by the winner. We also learned that it was open bar. Here are the menus. We'll present the food in the order in which it was served and the menu it is from. Note that these are iphone pictures so they are not up to our usual mediocre standards. So first up was a welcome drink called Malort Jamison Sour (Ripasso). Dave never heard of Malort before, but apparently it's some liquor made in Chicago that's quite nasty. Mixed with the Jameson and sour - pretty tasty. Next up was the Steelhead Roe (Schwa). This was served family style. 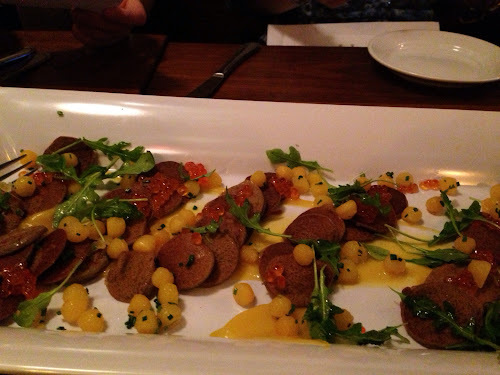 On the plate were round circles of rye bread topped with roe and herbs served over a mustard base sauce. 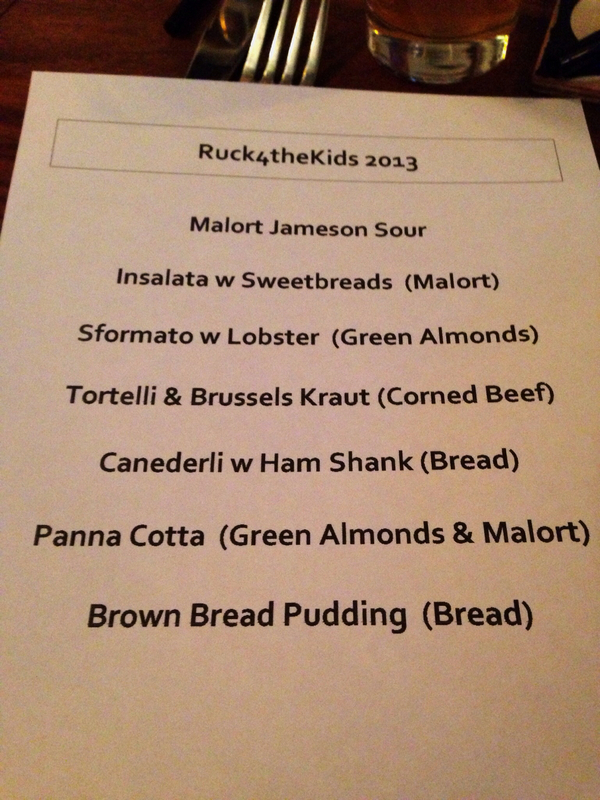 Flavors worked well but we all thought the rye got too soggy and should have been toasted. Insalata with Sweetbread and a Malort dressing was next (Ripasso). We were all thinking "good - get the brains out of the way early". This was actually tolerable. 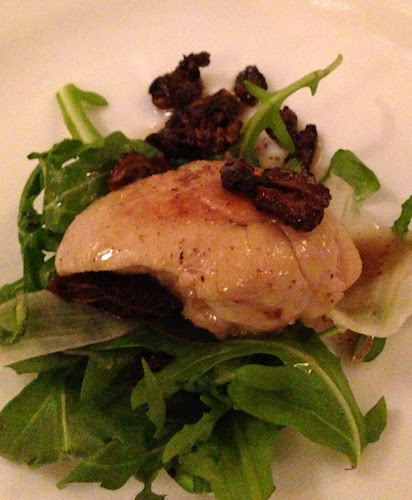 The dressing and the addition of morels was nice. Next up was a real crowd pleaser at our table. Panzella (Schwa) was sort of like a parmesan bread pudding served with a parmesan sauce that was grainy and cold tomato gelato. Each ingredient on its own was very good, but combined it was amazing. Sformato with Lobster and Green Almonds came next (Ripasso). 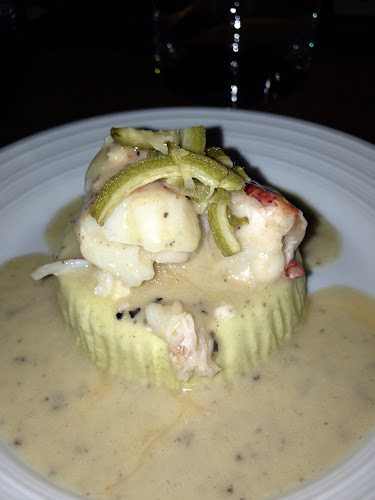 Not much to hate here - lobster, creamy sauce, on a starchy base. Theo explained that green almonds are only available for a limited time and they were one of his favorite ingredients. Next up was some corned beef (Schwa). Corned beef is not a favorite of ours. We usually go out of our way to avoid. Now take that concept and apply it to cow's tongue. 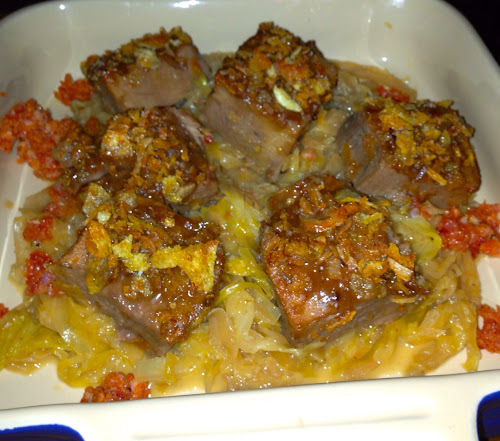 Yep - corned cow's tongue. It was actually tender and didn't necessarily have the full-on corned beef taste. 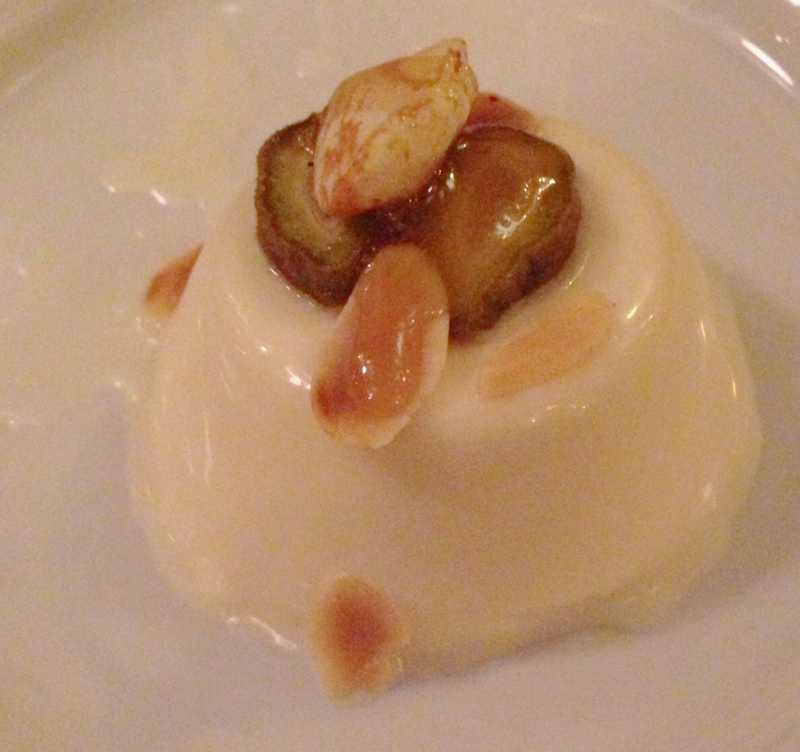 The next dish also came from Schwa. This was a deconstructed Reuben served in shot glasses. 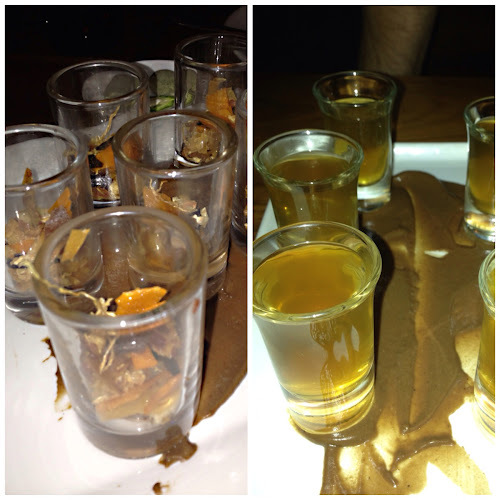 One glass had dehydrated items like kraut and meat - it looked like potpurri. 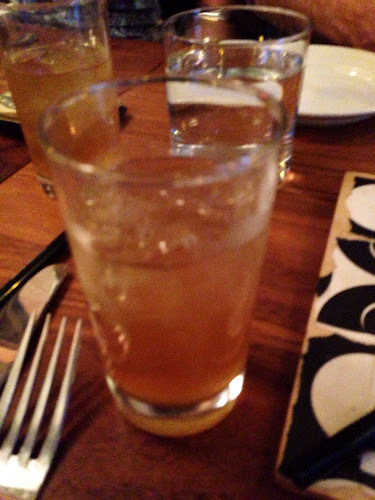 The other glass had warm corned beef consommé. We didn't like this - not sure anyone at our table did. Time for some more corned beef (Ripasso). 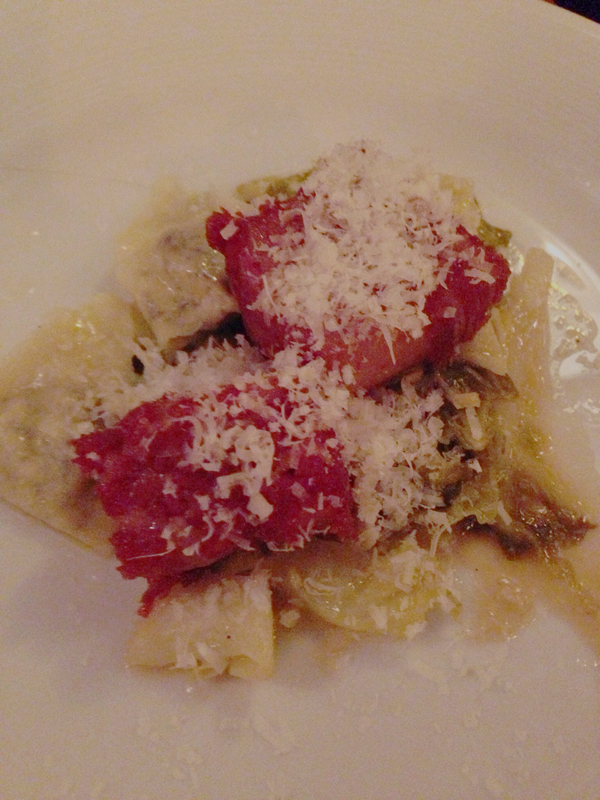 This time the beef was your more traditional corned beef, but it was served with a brussel kraut tortellini. Liked the pasta, not the beef. Gnocchi was our next dish (Schwa). 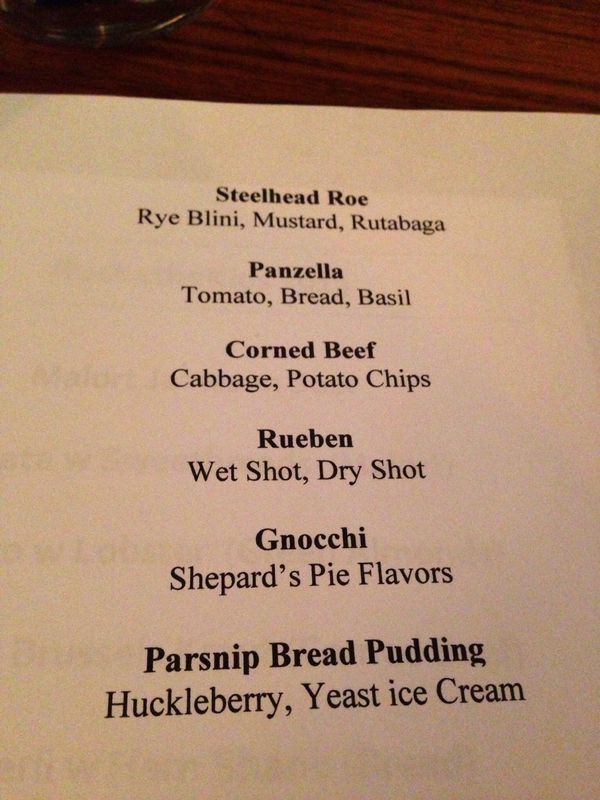 This version was based on the flavors of sheperd's pie. Very herbal. Good dish. The flash is reflecting off Dave's martian green iphone case - the colors were a bit more natural in real life. 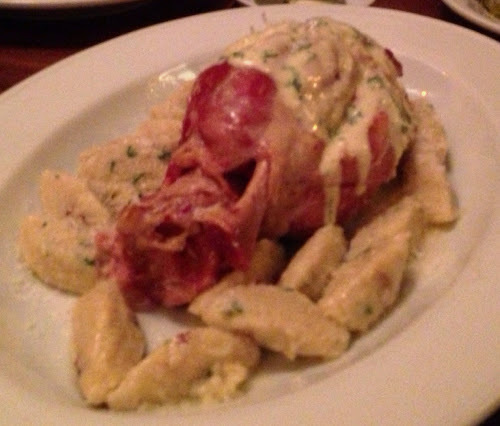 Our final entree was a ham shank (Ripasso). This was a big hunk of meat served family style with some pasta sides. A little salty for most of our tastes. Also, we were getting full at this point. 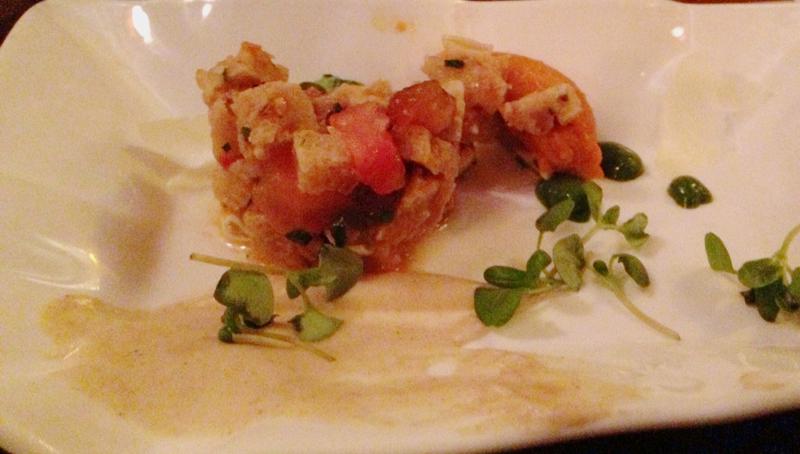 Now onto desserts: We started with Michael's Parsnip Bread Pudding. 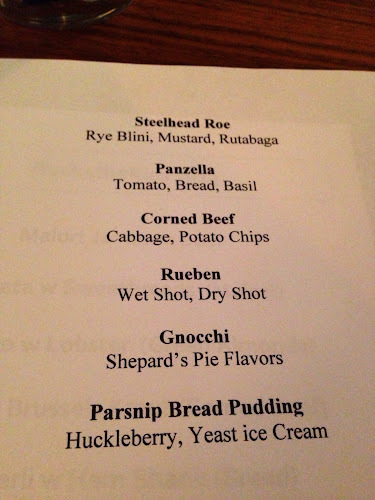 All components were pretty delicious - except the yeast ice cream. Interesting concept - just wish he went with vanilla. The toasted marshmallow sauce certainly made up for it. Next we got a panna cotta featuring more malort and green almonds (Ripasso). This is when Dave found out he liked pane cotta. Nice taste and decent texture. 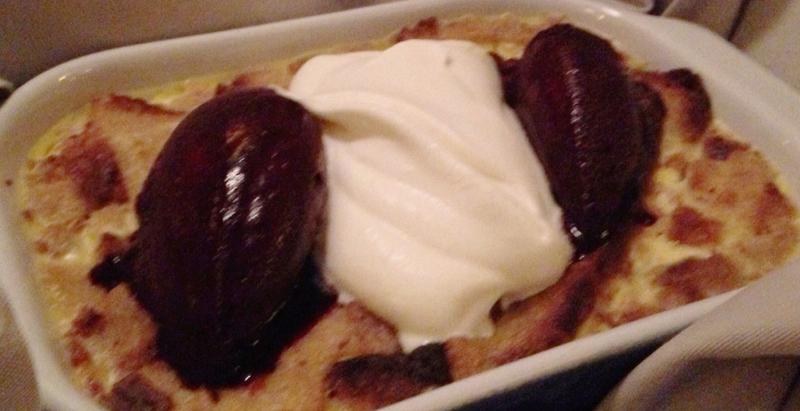 Final dessert was another bread pudding (Ripasso). This was served family style and was served with a good helping of huckleberry sauce. At the end of the evening they drew numbers for door prizes. Dave and our friend Bill checked out the table early and found wine, hats, and shirts. So they counseled the rest of the group to just pick wines. Holly got to pick third and she took a wine. What had transpired since the scouting mission was the addition of gift certificates to each restaurant written on postage-stamp sized paper. Unfortunately she missed a high-value prize. Oh well, the wine was very good. Our votes for the winner were tallied and Theo was declared the winner. Michael was going to get a tattoo of the Red Headed Stepchild logo. After dinner we went to Black Rock for the after-party and had a couple of beers. 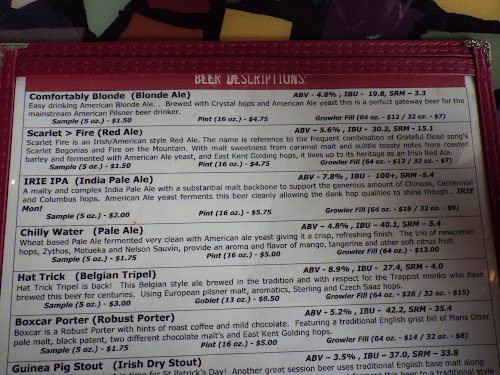 Nice beer list here. Also worth noting, before heading to the restaurant we also visited two other good beer bars: Jake Melnick's and Galway Arms. Overall we had a fun day out in the city and enjoyed watching two great chefs face-off and show their creativity. If you remember my blog post from a few weeks ago regarding the new runDisney events for 2014, you will recall my excitement. I blame that excitement and status update from Eddie McCoy for signing up for the Knoxville Marathon 2 weeks before race day. Eddie put up as his status “Knoxville Marathon April 7th , Hmmm…… “. I took a look at that and thought the same thing. I figured airfare would be crazy, it wasn’t. I figured we wouldn’t be able to get a reasonably priced hotel room. The host hotel was still available and it was very reasonable. I figured Dave would never go for it. He did. So I signed up for the marathon. It was crazy, but I would get another state out of the way and we would get to spend the weekend with great friends. You already heard about the fun of the weekend so far (post 1 and post 2), but now it’s time for the race. The host hotel was great, right at the start line. We walked out of the hotel and right into our corrals. The weather was perfect. Nice and cool and it never did get too warm. Eddie and I were doing the full and Anna was doing the half. We were all going to run together. I did take a look at the course map and elevation and noticed it looked quite hilly. That was an understatement. The course started off with a big hill right from the start and that was a sign of things to come. 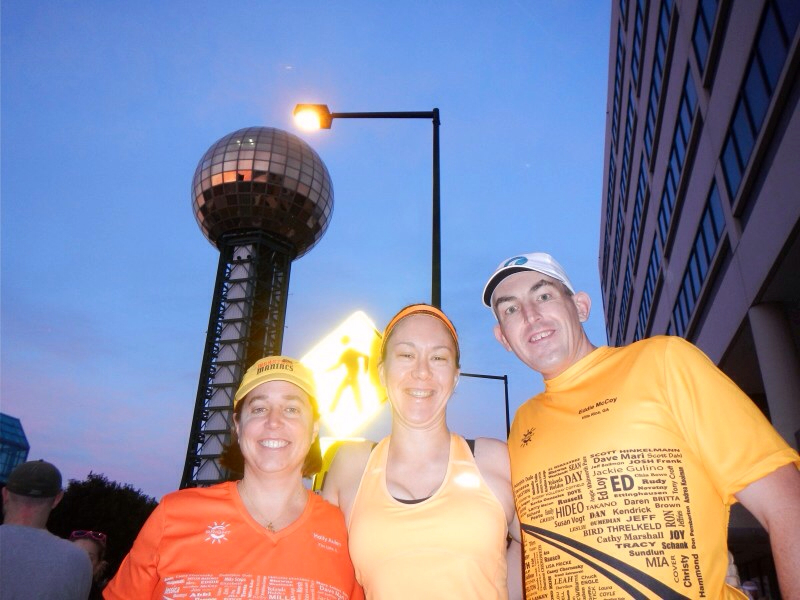 We were all having fun and the course took you through some beautiful areas of Knoxville. There were lots of nice neighborhoods with great spectators and live music. I was feeling ok but knew the hills were taking a beating on my legs. The funniest moment of the race was when we got to a Starbucks and Anna had to stop and get something. 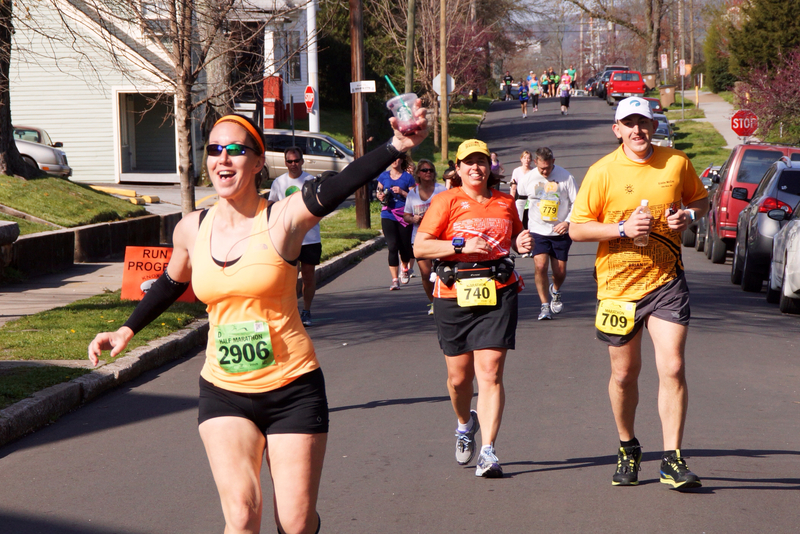 It was at mile 11 so she was almost done and really enjoyed that Starbucks! In fact she was so happy that we almost convinced her to join us for the full. But she was smarter than that and turned off at mile 12.5 and left us behind. After the split for the half it got pretty lonely out there, but there were still bands and spectators on the course. I told Eddie I wouldn’t start whining about the hills until mile 20. Unfortunately by the time we got to mile 20 I was too tired to whine. This is one tough course. I was glad that Eddie was keeping me company. 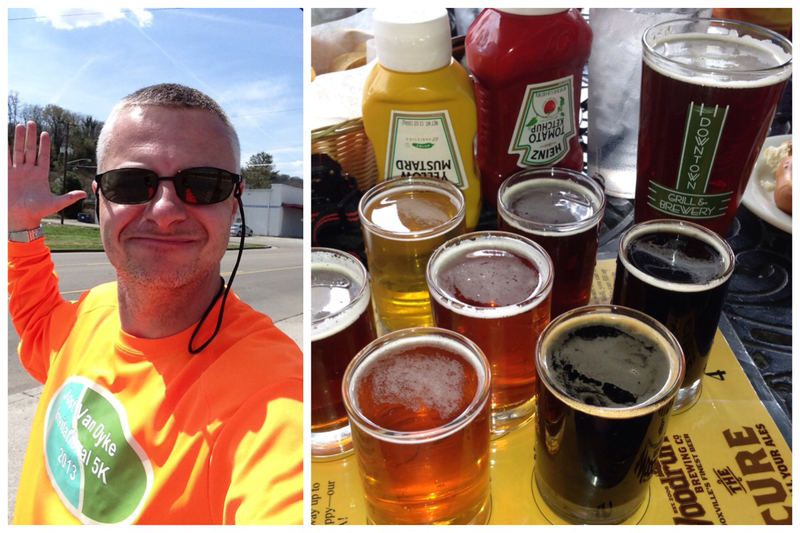 We found a beer stop at mile 23. It was of course awesome! 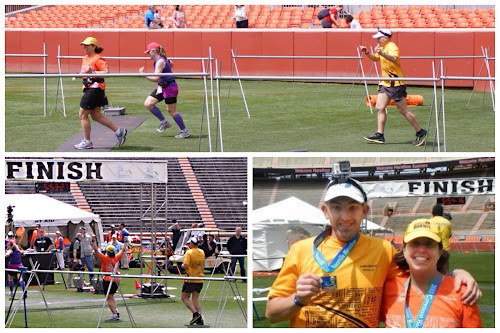 We ran into a first time marathoner towards the end and it was great to see her finish her first marathon. The course finished inside the University of Tennessee’s Football stadium. It was very cool to run into the stadium and finish on the field. We were given a nice medal and a finishers hat. They also had excellent finishers food. Rita’s Italian Ice! It was a great race and I’m pretty happy with the 5:50 time considering how hilly the course was. I would definitely recommend this race to anyone, but beware of the hills. I was extremely sore for a few days after. We have 3 videos posted from the race. The first video is our race video which Dave mostly filmed while following the course. Next is the video Eddie filmed while on the course. The third video is the entire 2 miles Eddie wore Dave's GoPro on his head. It's sped up so you don't have to sit through it real time. After the videos we have some comments from Dave. This was a super easy course for the spectator. The roads were open to car traffic with the exception of a couple of miles. 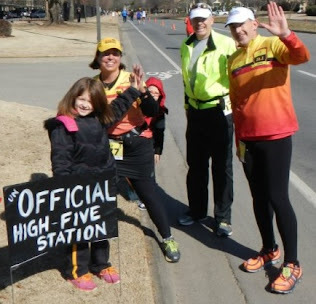 I saw the crew at the start, mile 2.5, 3.5, a drive-by at 4, 8 (snack time), 12, 13.5, 14.5, 14.9, drive-by at 15.5, 19, drive-by at 19.5, 20, 23, and the finish. I wish I was more familiar with the city so I could have maybe watched in a cooler location vs. the run-down neighborhoods I always end up watching from. it was nice to get to see some of the live acts along the course - there were some really good singers out there. After the race we hit the nearest microbrewery - Downtown Grill and Brewery. 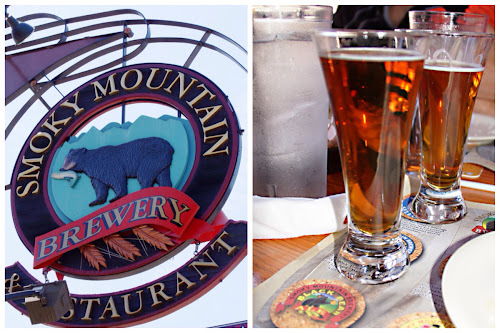 Great food, generic beer. 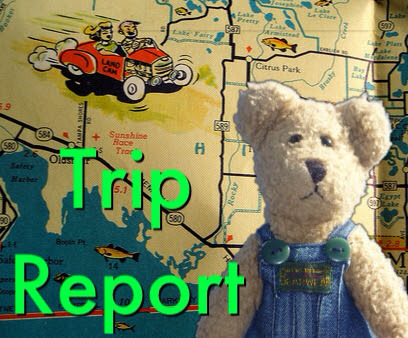 Our friends Eddie and Anna came up with the idea to leave Knoxville on Saturday and take us on a little tour of Tennessee. After the race expo we hit the road with three destinations planned: Pigeon Forge, Gatlinburg, and Great Smoky Mountains National Park. 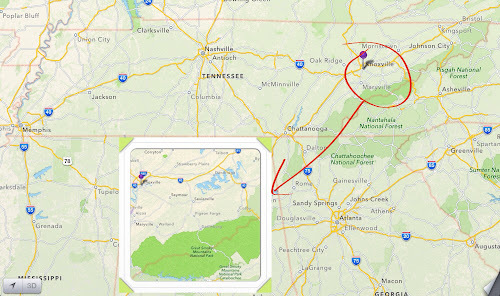 The drive to Gatlinburg took us through the greater Pigeon Forge area. 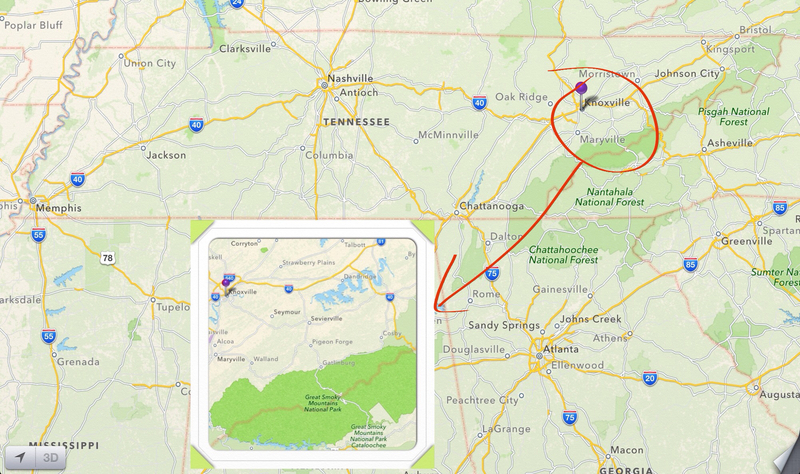 The town is famous nationally for being the home of Dollywood - Dolly Parton's theme park. On a regional level it's also famous for pancakes, go-karts, min golf, and knives. The National Knife Museum is in the greater Pigeon Forge area. Who knew? 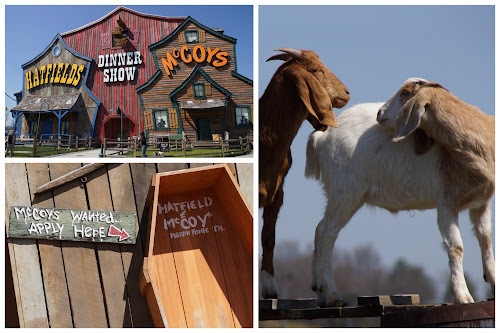 Dave was intrigued by a couple of billboards along the road advertising The Hatfield and McCoy Dinner Show. The ads made it look like total hillbilly cheese. 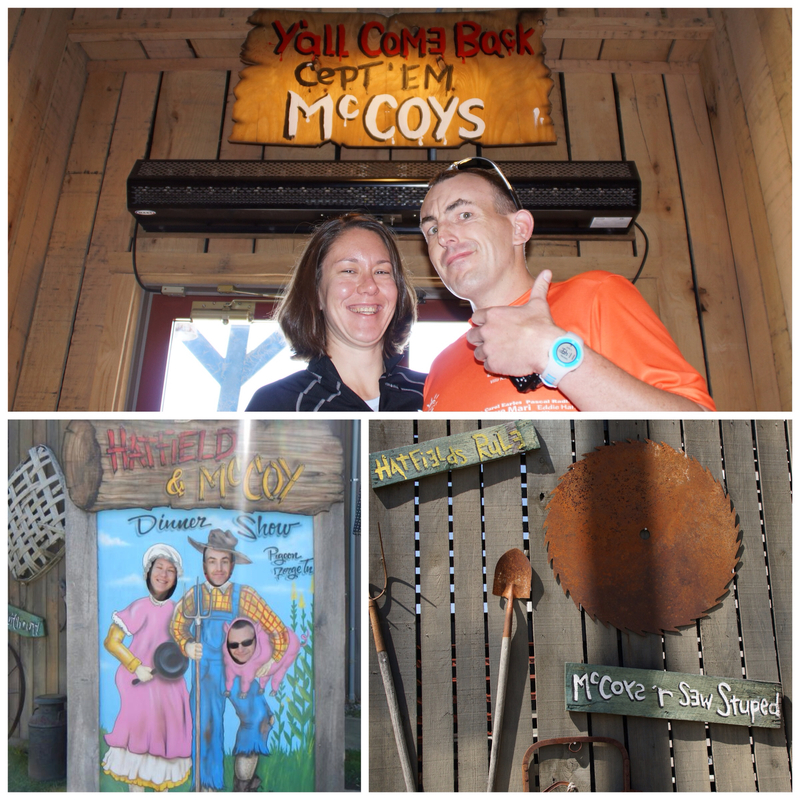 Now since we were traveling with people whom held the name McCoy, we had to stop. 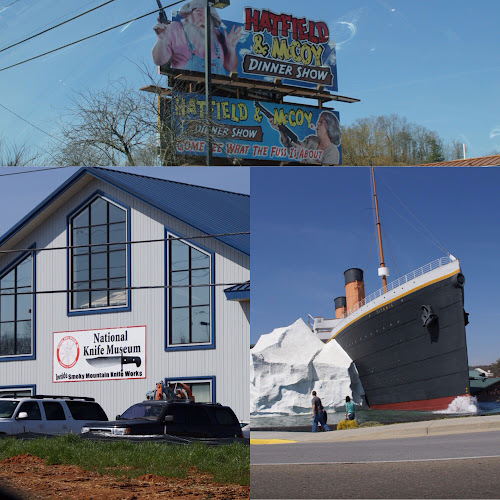 The showplace was sandwiched between WonderWorks (a playplace/museum housed in a upside down mansion) and the Titanic (a museum shaped like the ship complete with iceberg). When we started looking around we assumed this was a former Disney Imagineer's brainchild. The themeing was quite good and the props didn't look too cheap. Plus, you've got to love restaurants with penned up livestock out front. In well-themed pens they had chickens, pigs, and goats. When we checked-in on Facebook a friend of ours replied back stating the show and food were actually pretty good. With all the pro-and-con McCoy props we spent a good amount of time taking photos. Traffic was heavy getting into Gatlinburg. There's not too many places to expand the roads because of the river that runs through town. Parking is also at a premium in G'burg. 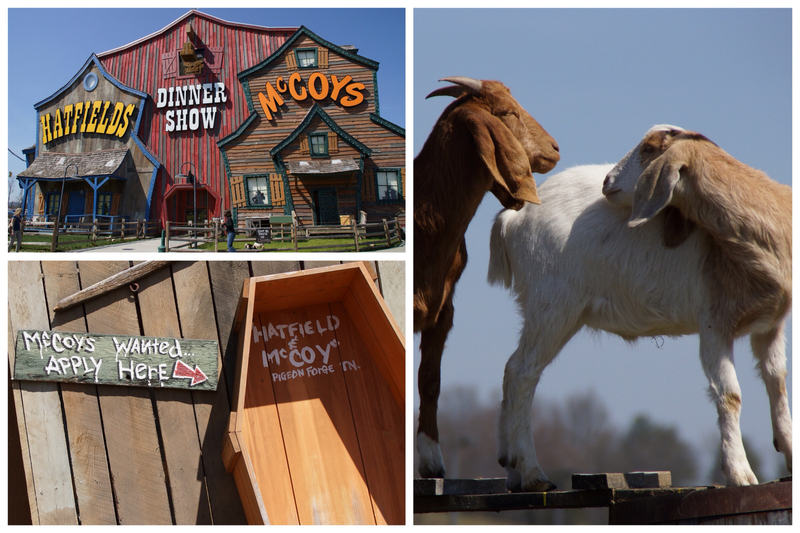 Overall Gatlinburg is an expanded tourist area of Pigeon Forge. There were some chain restaurants, mini golf courses, arcades, and a variety of shops. We started out with lunch at Smoky Mountain Brewery. Eddie and Dave found samplers were a good deal - 6 5oz samplers for $6. 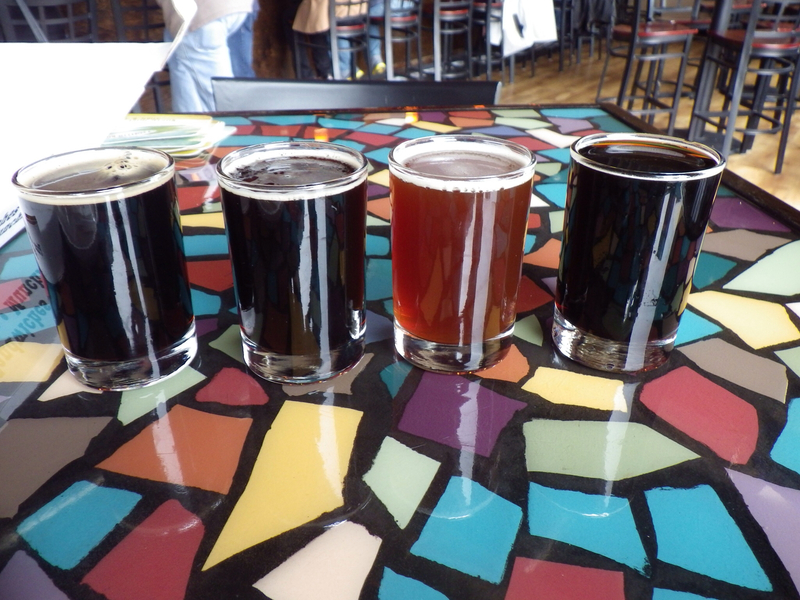 Each beer was sorta a mellowed version of the style it represented - still pretty good. The food was good too. 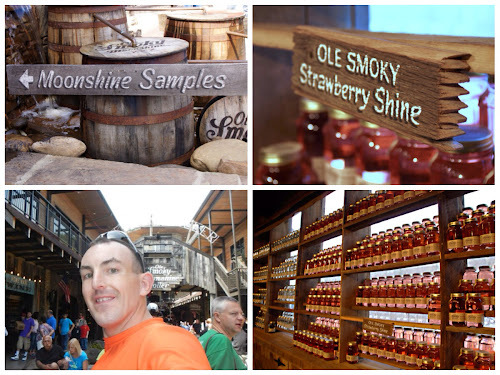 Our next target attraction was Ole Smokey Moonshine. As a tourist you first learn about Ole Smokey the minute you get on the highway leaving Knoxville. Billboards seemed to be at every 1/2 mile mark along the drive. They had a nice complex with a center court stage where a blue grass band was playing. They had displays on the making of moonshine process and the history. Inside the main store you could sample any or all of their items - we'd estimate 10-12 items from 100 proof vodka to lemon, cherry, grape flavored moonshine. Dave likes his straight liquors, but not this stuff. It's just clear and unrefined. Costs for mason jar-sized bottles ranged $25 - $35. They were doing ok.
We left town and started driving into the Great Smoky Mountains National Park. Alot of our drive followed a swiftly moving river and every so often we passed a waterfall off the side of the road. 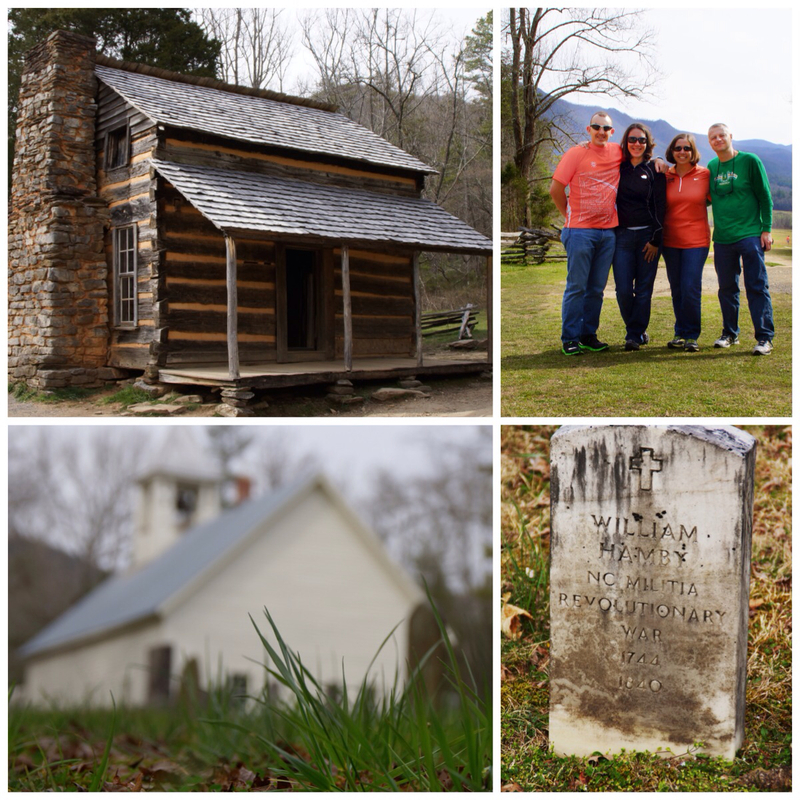 Our main destination within the park was an area called Cades Cove. This is a very pretty valley where some early settlement building were still intact. Deer and turkey were hanging out in the open, not paying any attention to hikers or cars. 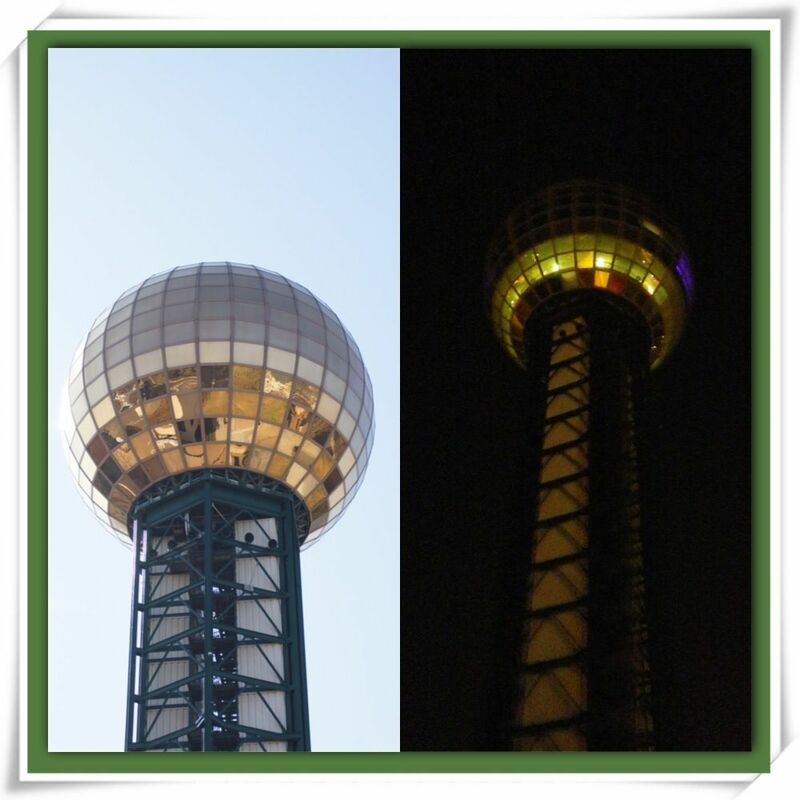 Back to Knoxville for dinner at a Puleo's Grille location and then bed. The next day was race day. I am a worrier. Most people who know me would never guess this about me. Dave is well aware of this issue, as are my parents. I’m not really sure when it started. I believe it was sometime in college when the stress of being away from home and the demanding studies of engineering were sometimes overwhelming. I graduated from college and became a bit more carefree, but I always seemed to have something to worry about it. I met Dave and then started to worry about him because he is the most important person in my life. Not in a totally unhealthy way, but definitely more than I would say the “normal” person would. I knew I needed something to help alleviate stress and worry but couldn’t find anything. I tried reading books- “Don’t Sweat the Small Stuff” was particularly good and it helped for awhile but the worry and stress would creep back in. Then I took up running. I initially did it to lose weight and get healthy. 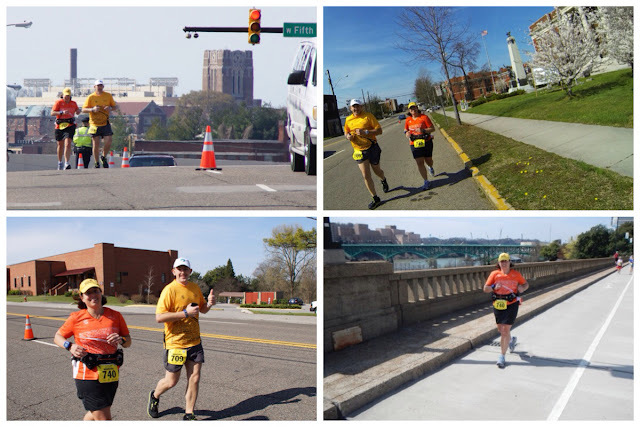 8 years ago this month I started training for my first marathon. I did lose weight and I did get healthy. But the most unexpected thing that happened was my stress and worry went WAY down. Running is my therapy. When you have miles on your own to think about things it’s amazing how you can solve all of that week's problems. I love it. I love running marathons. Which is also odd for anyone who knows me, especially since I hate crowds. I remember my first marathon, Chicago Marathon 2005. 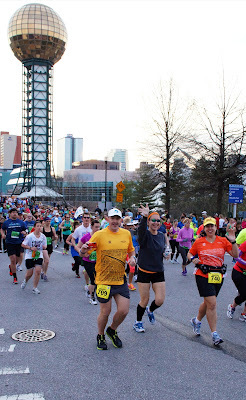 It was crowded and getting to the corrals and to the start was a nightmare. There were long lines for port-o-potties. All things that in my normal life I would never put up with and that would normally cause me more stress and worry. 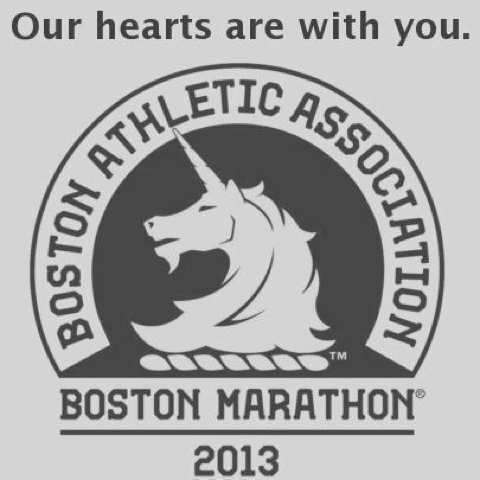 But on marathon day, I am able to ignore this because I know we are all there to run a marathon and have a great time. Then Boston happened. My carefree world has now been shattered. At first I cried, heck I’m crying now as I am writing this, but now I am angry. Dave and I love traveling across the country to see new places while I’m running marathons. I never once worried about Dave out on the racecourse, driving around strange towns and hanging out in seedy areas of the course. The old me would have been a basket case. Now after this week, all I can think of is Dave standing at the finish line with all his cameras waiting for me to come by so he can get that perfect picture. What if I was in Boston? What if it happens again? I am struggling mightily with these thoughts. I feel for 8 year old Martin Richard’s family. He was there waiting to cheer for his aunt. Now he is gone. One of the highlights of running a marathon course is getting high fives from all the kids. I don’t know how I will high five kids in the future without thinking of him. 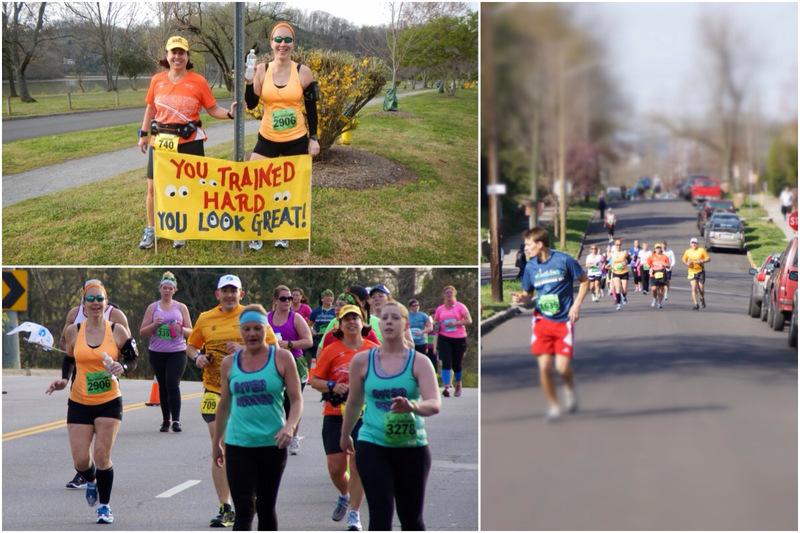 Spectators on the course mean everything to a marathoner. They all carry us through the race. I can't tell you how many times a simple cheer has lifted me up. The thought of someone targeting them makes me sick. But I am not going to give racing up. This is my escape. I have a marathon in two weeks in Cincinnati. Dave and I will be going. We have plenty of friends that will be there. I will run this marathon for all those injured and killed and I will high five those kids along the way and think of Martin. I’m sure many tears will be shed. I know I will be worrying about Dave, but hopefully that will lessen in the future. I know it will never be the same, but we can’t live in fear. As this week has taught us more than ever, life is short and NEVER EVER take it for granted. LiL iFFy - Not even gonna give out the link. Just horrible rap. Chased us out. When we left we found that the neighboring bars were getting into party mode. Lots of current dance hits and rap coming out of the bars up and down the street. We went to our next planned stop, The Crown & Goose. It's your typical English Pub theme. 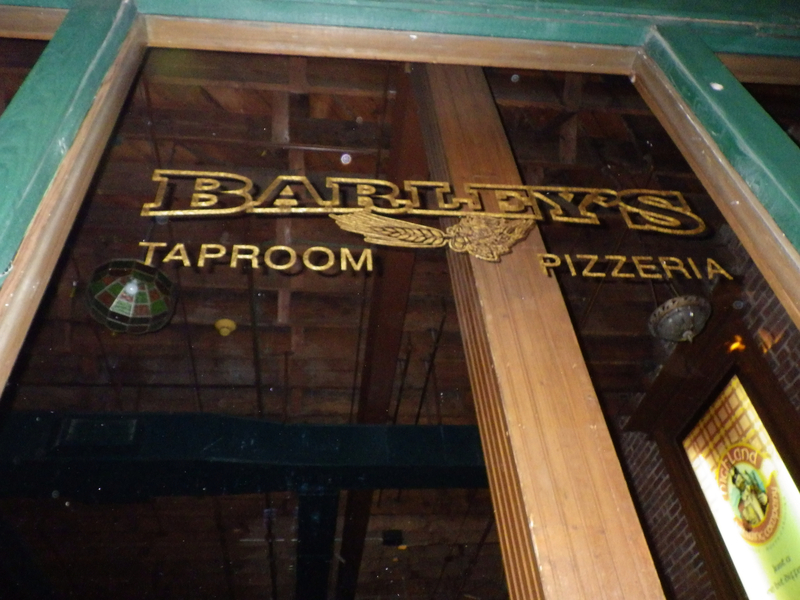 This caught Dave's radar because they had two of their own beers on tap. 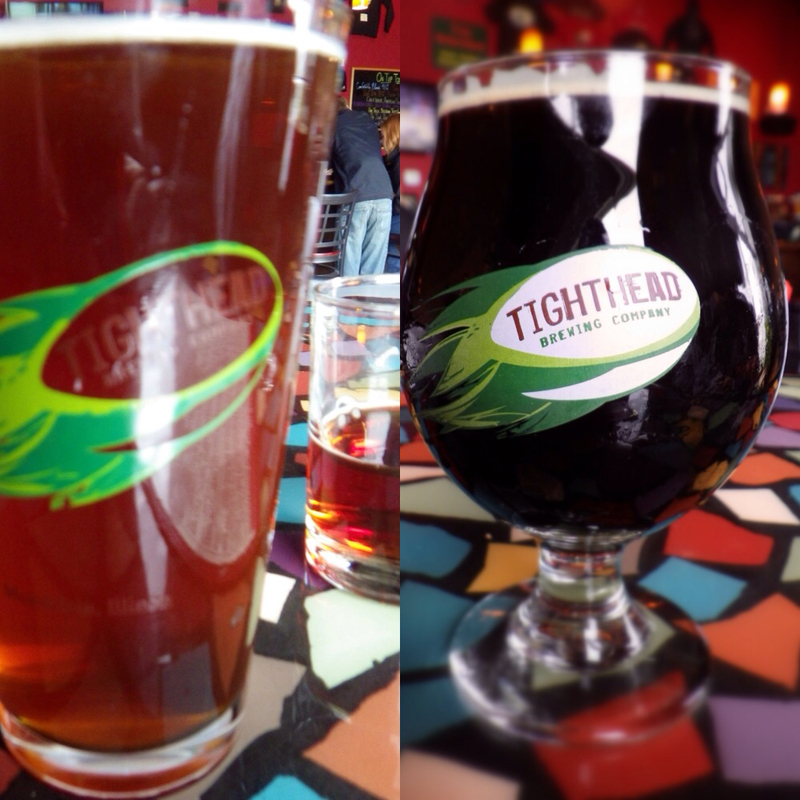 One was an oatmeal stout and the other an IPA. The oatmeal stout was too bitter for Holly and Dave and the IPA Eddie ordered was a wheat IPA (unfiltered). Eddie doesn't do wheat. Anna made a good choice sticking with wine - and getting into a debate with the barkeep over The Fresh Prince of BelAir. It was after 1am - time for bed since some of us were actually here for races. As we approached the hotel we saw flashing lights in the Sunsphere - the tower from the 1982 World's Fair. Intrigued we asked the front desk about it. Turns out there's a bar up there open until 3am. No discussion was necessary - we all headed for the door. We crossed the street and took the rickety elevator (complete with "no jumping" warning) to the fifth floor. We were in a totally white room with Jetson-style chairs and some really good club music playing. Yes, this was more club than bar and we were under dressed. Fortunately it wasn't crowded and the staff made us feel right at home. The biggest shock was the drink prices - reasonable. 3 cocktails and a beer under $25. 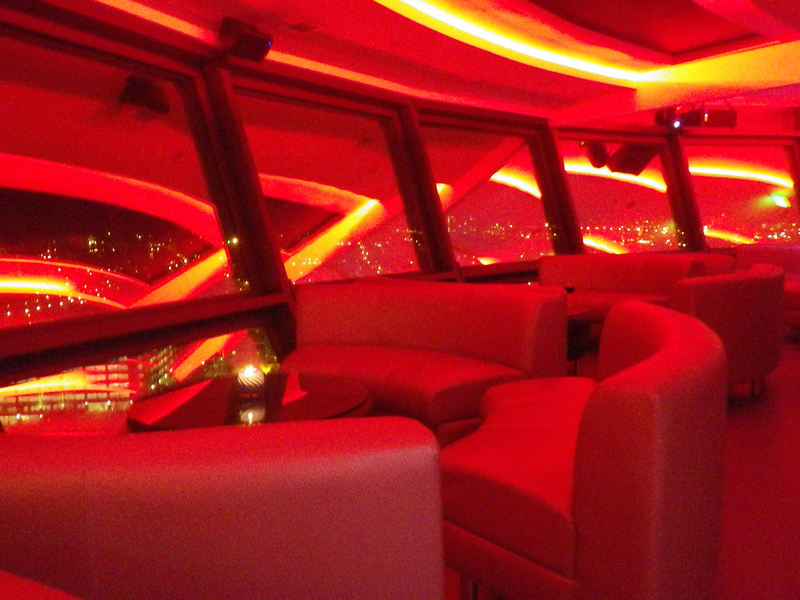 The view of the outside was obstructed by the lighting scheme inside that changed colors every so often. We stayed for one for one round then decided it really was time to go to bed. Eddie and Anna had a fun-filled day planned for us in Pigeon's Forge and Gatlinburg. The first house we owned was in Mundelein, Illinois. At the time, it was a growing suburb with lots of new development homes built on former farm fields. When we lived in Mundelein there wasn't much shopping or dining. We would go to nearby Vernon Hills or Libertyville for those luxuries. We haven't lived in Mundelein in 11 years. Little has changed since we left except for the big Target/Home Depot shopping center and the opening of Tighthead Brewery. 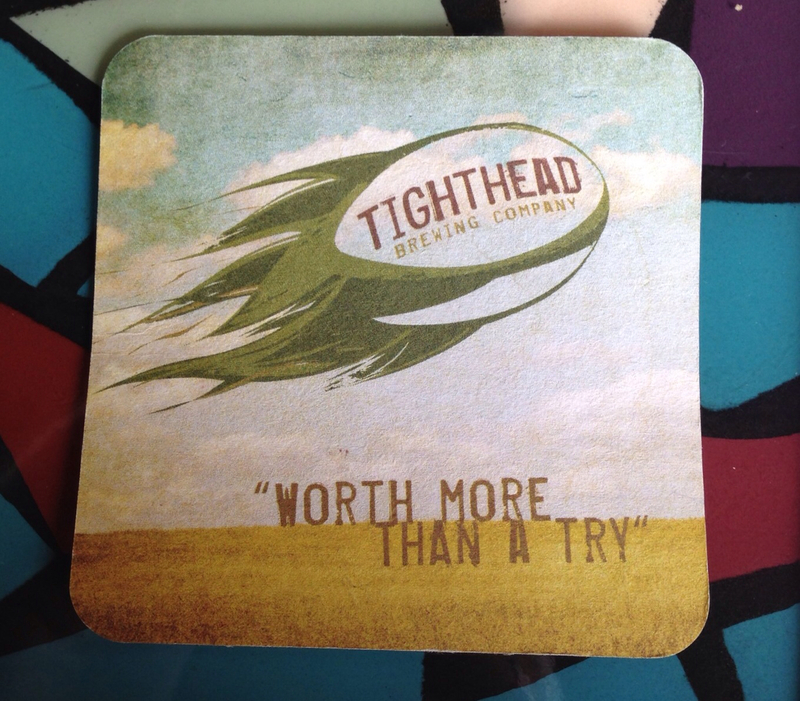 We first learned of Tighthead Brewing at (where else) a local bar. 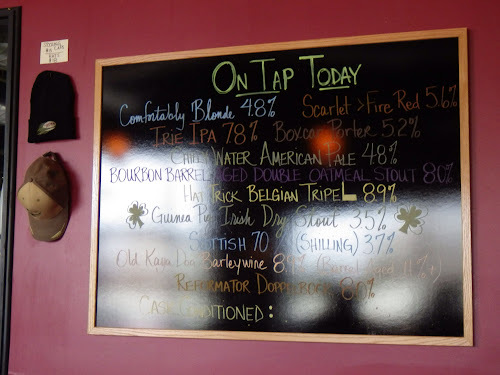 They had 3 of their beers on tap: Comfortably Blonde, Scarlet Fire, and Irie IPA. 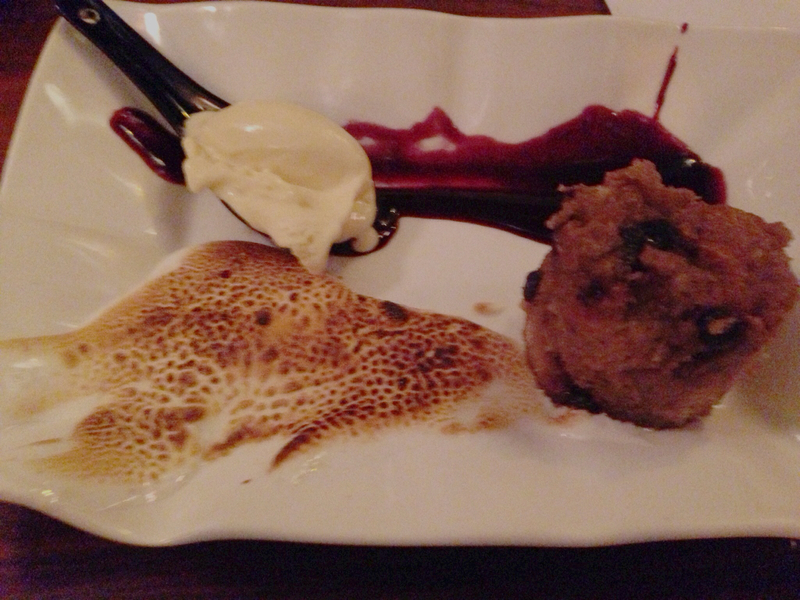 We both took a liking to Scarlet Fire and would order it whenever we found it. Tighthead's been in operation since 2011 and currently produces 3,500 BBLs a year. Distribution is limited to kegs for local restaurants and their tap room. 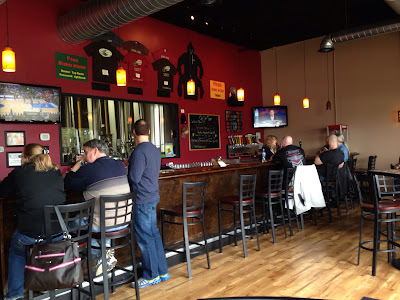 The tap room operates mostly on weekends. It's tucked into the corner of a newly built light industrial building. There are about a dozen seats at the bar and another 6 tables that can seat and extra 24 people. Windows behind the bar look into the brewery. They don't serve food, but they do encourage guests to bring in their own, or order it in from local delivery menus. We opted to bring in our own lunch to enjoy with their beer. 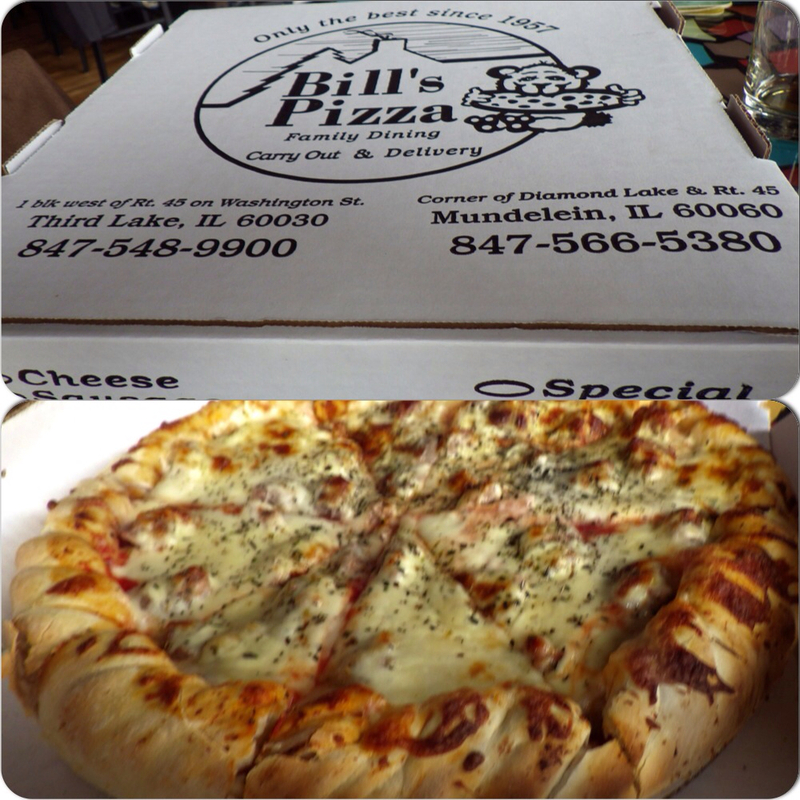 We picked up a pizza from an iconic Mundelein eatery: Bill's Pizza and Pub. We ordered a small double decker - which is esentially two pizzas stacked ontop of each other. 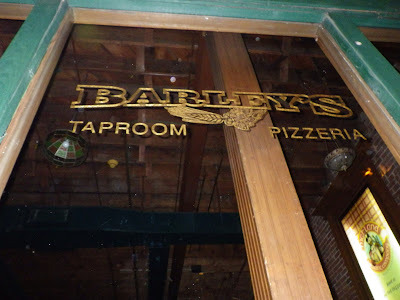 When we first moved out to Illlinois this was one of our favorite pizzas, mainly because it was the closest thing we could find to NY style pizza in this area (we are not fans of Chicago deep dish and don't prefer the thin crust options over NY style). It's still a quality product, but given the huge changes we made in our eating habits over the years, it was not a favorite anymore. What we didn't eat that day took Dave 2 lunches to power through. 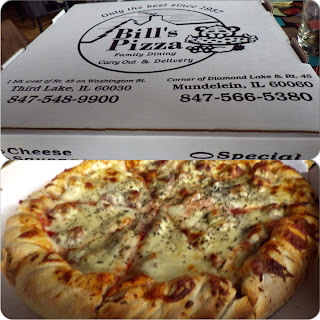 Bill's Pizza is still worth a visit. It's been around since the 50's and has a hunting lodge feel. Lots of wood tables, peanut shells on the floor, and a bunch of taxidermy animals. The first surprise was the number of beers on tap at one time for such a small brewery. There were 11 to choose from. The tabletop menus gave you enough information about the beers to make an educated choice. The 70/- is a Scottish style session ale that is low in alcohol and has a nice malty sweetness and creamy texture. Using English base malt, Carmel, Chocolate, Munich malts and flaked barley, the beer uses East Kent Golding hops, but in very low quantities and are barley noticeable. 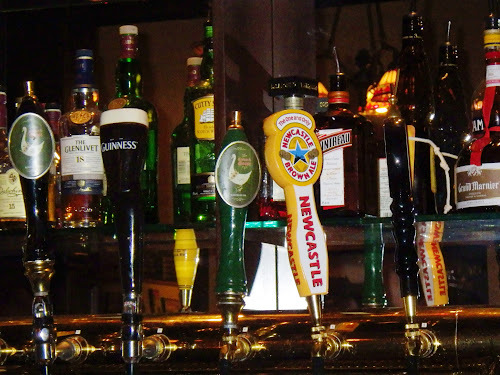 Scottish Ales are named for the price paid per barrel in shillings and was based on the alcohol level. After the samples Dave ordered a pint of Scarlet Fire and a sample of doppelbock. Holly re-ordered the Double Barrel Oatmeal Stout. That one came in a snifter. Either the waitress messed up our samples or the snifter brought something more out in the beer - she didn't enjoy it as much as she did in the sample glass. The only way to bring any of their beer home was in a growler. Shirts, hats. and glasses were available for purchase. Prices on drinks were hit or miss. Most samplers were under $2 with a few getting as high as $3.50. All our drinks were $24 before tip. 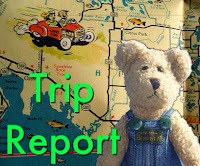 Overall we had a fun lunch there and if we were in the area, or had an interested house guest, we'd stop there again.